ANNUAL CHRISTMAS BEAR 2016 BRAND NEW _ PERFECT PRESENT! 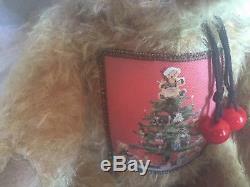 15.25 INCH MOHAIR TEDDY BEAR FROM GERMANY. 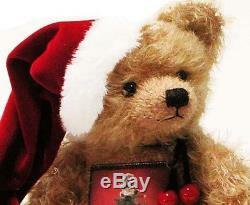 "Weihnachts Bear" Hermann-Spielwaren GmbH Coburg Fully-Jointed Collectible Mohair Bear. This handsome teddy bear is hand-made of mohair with traditional excelsior filling. He wears a red cap with white trim and white bobble on the end. 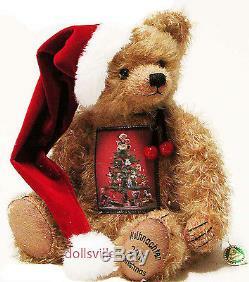 On the front of this handsome bear is a colorful image of a Christmas Tree decorated with HERMANN Christmas Ornaments and Teddy bears, from one of their past catalogs, 15214-7 HERMANN Christmas Bear 2016 Annual Edition 2016, Only produced in the year 2016. Size: 39 cm = 15.25 inches tall. He has a Growler Voice. German Mohair Teddy Bear, fully jointed. Hermann-Spielwaren create beautiful Mohair teddy bears in Coburg, Germany in the traditional style. They have produced teddy bears for the world for three generations. What started with just a handful of teddy bears has grown into an amazing variety of unique bears each with their own personality. 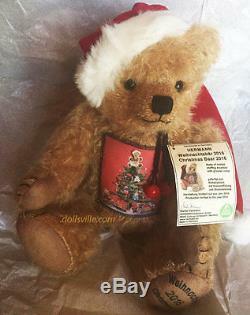 "Weihnachts Bear" Annual Christmas Bear 2016. Dollsville Dolls & Bearsville Bears. Dealer with a terrific selection for you to choose from. Proudly Serving Collectors Since 1979. The item "HERMANN-Spielwaren Coburg WEIHNACHTS Teddy Bear Christmas Annual 2016 Mohair NEW" is in sale since Thursday, May 4, 2017. 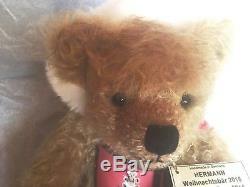 This item is in the category "Dolls & Bears\Bears\Hermann". The seller is "dollsville" and is located in Palm Desert, California. This item can be shipped to United States.